Are you as excited for the holidays as we are here at RevLocal? I know. I know. It’s only October, but for your holiday marketing strategy to be effective, it’s best to get started planning holiday campaigns now! Don’t leave it until the last minute. You’ll need that time for frantically buying gifts at your local gas station because everywhere else is closed spending time with friends and family. We wanted to share our excitement (and a few marketing tips) to help you get started and hopefully enjoy a profitable holiday season. Did you know holiday sales account for 20 percent of all sales for most retail businesses? Our holiday marketing tips will help you make the most of this increase in sales during the holidays. We put together a festive Ask Us Anything with tips from our Digital Marketing Strategists on how to prepare for (and be successful during) the holiday season. And keep reading for more tips! Now is the time to be yourself, be kind and get personalized. Talk to your customers like they are humans (and like you are, too). Give personalized suggestions, and personalize all your holiday communications with customers. How can you personalize your holiday marketing? If you’re running ads or sending holiday emails, segment your audience. You don’t want to send someone who just ordered a product from your eCommerce store an email about buying more of the exact same item. Segment your audience into groups of customers, and send different campaigns to different groups so you aren’t promoting the wrong items to the wrong customers. On a similar note, if you have an eCommerce store, recommend products based on past purchases or browsing history. Most eCommerce software providers offer built in tools that will provide your customers with related products based on their purchase history. Take advantage of these sales and marketing tools to increase revenue this holiday season. And serve retargeting ads or send emails to customers who have added an item to a shopping cart but didn’t purchase it. If you want to tailor the email to the holiday season, add a message about when the customer needs to purchase the item in order to get it before December 25th. Do you have a holiday tradition or a favorite holiday memory from when you were a child? Write about it, or ask customers to tell you about their holiday traditions while they’re in-store. You can build relationships that will bring customers back to your store just by sharing personal stories with them and listening to their stories. You won’t even have to try to sell them anything. They’ll remember that warm fuzzy feeling they got talking to you about childhood memories. Personalize for early and last-minute shoppers. Give early shoppers a special discount (even if it’s on a future, last-minute purchase) to reward them for starting early and purchasing with your business. And make last-minute shoppers feel at ease. More than nine out of 10 consumers have had do last-minute holiday shopping. If you’ve ever been in a drugstore on December 24th, looking for a present for your great aunt Mabel who definitely doesn’t need another jar of jam, you know how stressful it is being a last minute shopper. However, you should remove as much friction as possible from their shopping experience. Personalize ads and emails to last-minute shoppers once December hits. Make them aware of shipping and fulfillment deadlines. Offer gift wrapping services or gift cards to stressed-out last-minute shoppers. Don’t forget to adjust campaigns for different channels. Is your Facebook audience slightly different than your blog audience? Create content tailored toward each demographic and platform. Offer special discounts or promotions on various channels. This is also a great way to get more social media followers or email subscribers! If you’re running an email promotion, let customers in-store and on social media know that they’ll receive the special promotion if they sign up for your email list. Remember this holiday commercial from Campbell’s Soup? If you look at the comments, you see that people are saying similar things, like “memories” or “it feels good to be a kid again.” Sure, Campbell’s is selling something in the commercial, but it’s successful because it reminds people of being a kid during the holidays. Don’t forget, though, to keep your target audience in mind. Who is your typical customer? What was popular when they were children? Appeal to your target demographic(s) and what makes them nostalgic. Depending on your customers, that could be Elf or It’s a Wonderful Life. If you’re not sure, you can always ask (like we mentioned before) what people remember from holidays when they were children. Keep in mind that not everyone celebrates the holidays the same way, so you’ll want your campaigns to be sensitive to that. And use some old-fashioned customer service to get customers in the holiday spirit. Be prepared to go above and beyond during the holiday season. It’s easy to get caught up in how busy you are running your business that you forget to slow down and make sure your customers have more than they asked for from you. With 70 percent of American consumers saying they are willing to spend more with companies that provide excellent customer service, you should look at your goodwill as an investment that'll yield returns well beyond the holiday season. As a consumer, it's easy to become overwhelmed during the holidays so put them in the holiday spirit. Send them good cheer. Send an email with no promotion or marketing, but simply to wish them a happy holiday season. Decorate your store. Set out cookies for customers who are browsing. Give them something to remember their shopping experience. You want to get the most from your holiday marketing campaigns, right? Well, one way to do that is to test different ad and marketing formats. Send an email with one message. Create a Facebook ad with another message or promotion. Make a display ad or a search ad for the holidays. 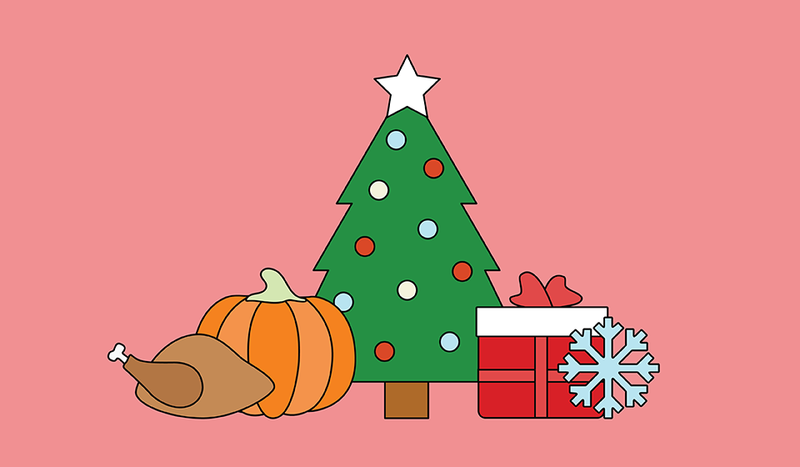 Test out a few different marketing channels of your choosing for the holidays. Although A/B testing can be more time consuming, it's worth the extra effort. After analyzing over six million sent emails, MailChimp discovered that A/B tested campaigns had a significantly higher open and click rate. Speaking of using this year’s data for next year, you can also look at last year’s data when planning your 2016 holiday marketing strategy. Did you run a holiday promotion? Did it work? Did you see increased sales but your margin suffered? Use the answers to these questions to determine whether a similar promotion would be beneficial or detrimental. For instance, are you running a free shipping promotion for your eCommerce store? If so, make sure you’re not losing too much money by offering free shipping on small orders. Consider having a minimum purchase amount for free shipping, otherwise you could be hurting yourself. And what were your top selling items last year? If you’re selling similar items this year, or you’ve noticed trends, make sure you have plenty of those popular items in stock to avoid running out early. Consumers will be searching for local places to shop this holiday season, and the best way to drive foot traffic to your storefront is to make sure your business shows up in those searches. Create, claim and/or optimize your Google My Business page. While Google isn’t the only search engine or the only place your business needs to have an online presence, the search giant recently added a live preview of how busy a business is at the time of the search. This means it’s more important than ever to make sure your business's NAP (name, address and phone number) is accurate across platforms, including Google My Business. Even if you don’t have time to optimize your Google My Business, Yelp, Bing! Local or social media pages, make sure to add correct NAP information across these sites. If your NAP is incorrect or inconsistent across the web, search engines won’t know where you’re located or when you’re open. You know what would be worse than a consumer not being able to figure out if you’re busy when they’re searching? It would be worse if your business didn't show up in searches at all. Make sure your online information is correct and consistent. Be there for consumers when they need you this holiday season. However you run your digital marketing campaigns for the holidays, remember to take a step back and enjoy the time with friends and family. It's not all about business. Some of it is about the food.